The trailers for "Taking Woodstock" had me thinking this was going to be some awards bait with the indisputably great director Ang Lee ("Brokeback Mountain") taking viewers back to the revolution, grace, and chaos of the infamous Woodstock Music Festival of forty years ago. Turns out this wasn't the case. Instead, Lee sits back too casually for his own good supplying a film that is gentle, humorous, and heartwarming, but is never impactive or even memorable. Any striking moments or images evaporate quickly from the screen and any lingering feelings dissipate after having walked out of the theater. This is too light of entertainment for a massive event that deserves much more. Sustaining a meandering and ambling tone, it certainly doesn't help that the existence of Michael Wadleigh's documentary "Woodstock" emphasizes this movie's shortcomings. Lee deliberately went for the backstage perspective as we follow the story of Elliot Teichberg (Demetri Martin) who unintentionally sparks the entire musical festival and brings forth the hippie movement. The film really boils down to the personal transformation of Elliot mirroring the cultural transformation taking place around him. It's apparent this is what Lee was shooting for, and he succeeds, yes, but only marginally so. Elliot's coming-of-age, and consequently his coming-out, story gets bogged down and diluted by the traffic jam of everything else going on. None of it connects emotionally, and everything any character says or does onscreen really has no resonance to stir viewers, and such a loss is impossible to ignore. Elliot is an interior designer who leaves New York to head upstate to help his parents run their dilapidated old motel where they're so strapped for cash that they charge $1 for a towel. Elliot becomes a stay-at-home son because he feels obligated, which prevents him from getting on with his own life. His mother, Sonia (Imelda Staunton), is a loud, oppressive, yet good-hearted Russian immigrant who has an endless fear of poverty. Her ever-suffering husband by her side is Jake (Henry Goodman) who just goes along for the ride. Elliot learns that a nearby town has refused a permit for the music festival, and so, as the head of the Bethel Chamber of Commerce, he offers the permit. He persuades a dairy farmer named Max (Eugene Levy) to let the barrage of hippies come and use his expansive acres of land to host the event. Little did Elliot know what he was creating, and soon he gets bombarded by angry locals and a sea of cars and foot traffic heading his way for Woodstock. And yet what is a movie about Woodstock without the music? The majority of the focus shies away from focusing on any of the music playing at the concert itself. Any footage of Janis Joplin, The Grateful Dead, Jimi Hendrix, Jefferson Airplane, The Who, name your band, they're all absent. We do, however, get to hear some music echoing in the distance as Elliot stands atop the hill at Woodstock and watches as the crowd before him turns into a sea of waving colors, light, and motion. A cool moment, a moment brought on by Elliot dropping some acid. The spotlight is on how the festival got started, how it got set up, and all that comes with a behind the scenes looks. The cultural period look of the 60s is spot-on, and Lee's attention to detail is impeccable. And while all of that is interesting, the real excitement comes with the actual reveal of the musical event which, once it does finally arrive, is disappointingly brief. An oddball and colorful cast of characters outshine Demetri Martin, whose bland performance ends up subsiding into the backdrop. Among them are an ex-Marine transvestite named Vilma who volunteers to be the concert security, played entirely straight by Liev Schreiber; the concert organizer who is chill and rides around on a horse, Michael Lang (stage actor Jonathan Groff); Elliot's buddy who returned from Vietnam, Billy (Emile Hirsch), who is strung-out and anxious; and even a couple of concert-goers (Paul Dano and Kelli Garner) who invite Elliot into their psychedelic VW van. But we never follow these characters fully enough, which causes the film's feel of inconsequentiality. 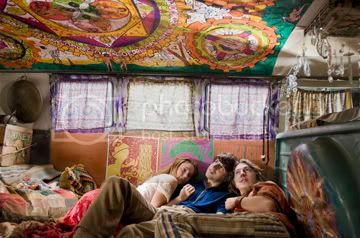 With "Taking Woodstock," Ang Lee took grand ambitions and mashed them into a result that appears to be purposely frustrating in thwarting audiences' desires. We stand watching from a hazy distance those "three days of peace and music," but we never end up seeing any of it really at all. "The fun for me became making other people vomit. It's an incredible thrill to have a thousand people, and you're like a puppeteer, you're pulling the strings, you're making them scream, and when I see people running out of the theater crying and vomiting, to me, that's like winning an Oscar." Well, he's succeeded. 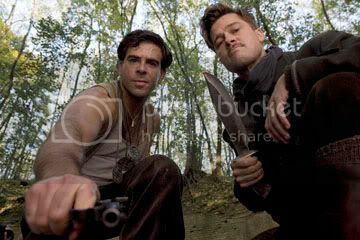 It's interesting to note, however, his furthering collaboration with Quentin Tarantino with "Death Proof" and now "Inglourious Basterds." 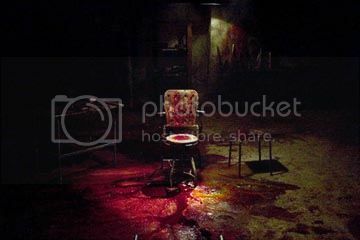 I'm just waiting, waiting ever so patiently, for director Eli Roth to crank out something really good. I can tell it's in there within him somewhere. With Hayao Miyazaki back in the mix, Pixar may have some real competition on their hands for once. "Ponyo" is the work of a classic filmmaker, and it's remarkable how Disney managed to scoop up the best animators of our time. The latest from Miyazaki is his own retelling of the fairy tale "The Little Mermaid," one that is fully realized in a world bursting with imagination and color. The story really is just an excuse for us to be invited into this world of endless creativity and limitless possibilities, a combination that creates a visually sumptuous pleasure to behold. While the plot is small, the themes being addressed are rich and full. The relationships between parent and child, between the elderly and the young, between people and nature, between loved ones, they're all to be equally cherished. The movie opens with an incomprehensibly dazzling scene of an underwater wizard interacting with sea life both modern and prehistoric, and this wordless introduction brings forth the pastel color style and traditional animation that Miyazaki uses throughout "Ponyo." One tiny goldfish swims away from the wizard and heads to the water's surface. There, a charming five-year-old boy named Sosuke (voice of Frankie Jonas, younger brother of the Jonas Brothers) discovers the nearly human-faced goldfish and claims her as his own. He names the little fish Ponyo (voice of Noah Cyrus, little sister of Miley Cyrus), takes her to school with him, and then to the nursing home where his mother (voice of Tina Fey) works. 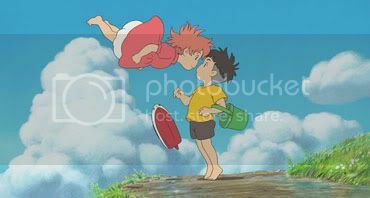 Sosuke innocently carries Ponyo around in a pail full of water not realizing that by allowing Ponyo to cross the divide between water and land, he has single-handedly created a massively dangerous tsunami with waves so high that flowing water ends up at the doorstep of Sosuke's hilltop home. From here begins a magical adventure for Sosuke and Ponyo as they journey to find their mom. By this time Ponyo has sprouted legs and arms of her own and even speaks. She also has powers to transform a little toy boat into one big enough for her and Sosuke to travel in. It's a dreamlike sequence as they travel across waterways among treetops and look beneath them to see fish swimming amidst the roadways. Other wonderful sequences are abound, including the introduction of Ponyo as she sprints her way across crashing blue waves. Meanwhile, the wizard is actually Ponyo's father, Fujimoto (voice of Liam Neeson). He is in search of Ponyo because he must return her back to the ocean in order to restore the balance of nature. He may appear sinister at times, but he ultimately holds good intentions. And although he despises humans for their polluting and wasteful habits, he simply wants to save Earth. 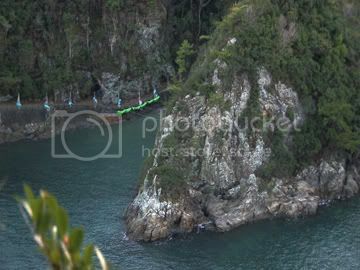 As with other features of his, Miyazaki's fascination with nature remains to make for a rather environmentalist piece. It also provides bountiful gorgeous scenery to admire. Thanks to Disney for providing the American version of "Ponyo" with a voice cast full of A-list actors. Keep your ears listening for, along with the other actors above, Betty White, Cate Blanchett, and Matt Damon. This isn't by any means Miyazaki's greatest achievement, but he also has a 30-year-long career working against him with masterpieces such as "Princess Mononoke," "Howl's Moving Castle," and an Oscar win for "Spirited Away." Nonetheless, "Ponyo" is still good-natured, absolutely enchanting, and adorable. This is Miyazaki tapping into his inner five-year-old to create a film that can entertain any person's inner child. 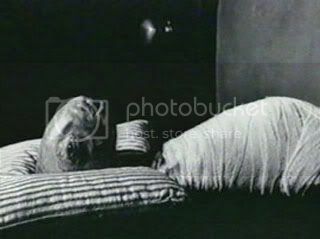 As much as I looked, there really is no official interpretation of David Lynch's "Eraserhead." And rightfully so. Lynch himself once stated that every interpretation he has heard hasn't even come close to the one he had in mind. As he does with the rest of his films, he refuses to shed any light on the meaning of the film which begs the question if there is any one at all. It was reported during the film's release back in 1977 that the film is Lynch's reaction to finding out he was to become a father. That sounds about right as the film deals a lot with oozing orifices, guttural noises, and some hideously deranged baby that can't even be considered human. According to IMDb, how Lynch made the baby is still a mystery. Supposedly it was created from the embalmed fetus of a calf, but the director himself has never confirmed this. After filming, he buried the calf in an undisclosed location and even had a wake for it. This baby that Henry is forced to watch over emits a grinding, wailing cry, an unbearable sound that drives his wife, Mary, insane. And it begins to drive us as viewers insane, too. Henry has an affair with a beautiful woman from across the hall, an affair that has them sinking into a pool of what could be bodily fluid. There's also the woman in the radiator who sings the haunting melody, "In heaven everything is fine." If in the radiator there's heaven, then the rusted, industrial, pipe-filled world in which Henry lives must be hell. 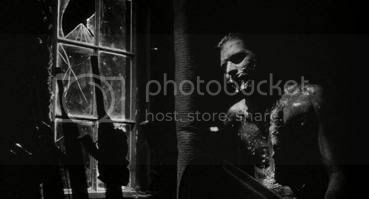 Void of dialogue for the first ten minutes and shot in a stark black and white, "Eraserhead" is full of moments and techniques that are echoed in his later films such as "Mulholland Drive" and, most notably, Lynch's 3-hour feature, "Inland Empire." It took him five years to write "Eraserhead," and he had a hard time receiving funding for the film because it contained a script of only 20 pages. And the parallels between his earliest and latest films are most prevalent because he began writing them at the same time. 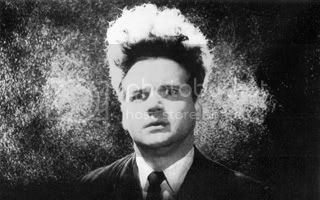 The origin of Lynch's signature style is introduced with "Eraserhead," a style that would go on to permeate throughout the rest of his work much later. Trademark moves such as strange and symbolic characters, an eerie and subtle soundtrack, shocking and grotesque images, and humor that's as black as night are all present. As much as the movie is indecipherable, I understand why it's revered as a classic in filmmaking. 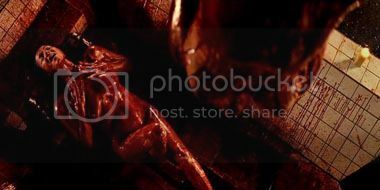 As a masterful array of textures, sounds, and images, it's a perfect nightmare. Uncomfortable to watch as it may be, there's no denying that this is a must-see for any person who has an interest in cinema. "Eraserhead" appears to be the purest and simplest (and most bizarre) of David Lynch we'll ever see, and it gives ideal insight into the mind of one the most eccentric and original directors of our time. There's something fundamentally puzzling about "The Time Traveler's Wife," which is based on the 2003 novel by Audrey Niffenegger. This is the romantic fantasy tale of a woman named Claire (Rachel McAdams) and her time-traveling husband. His name is Henry (Eric Bana), and he has a genetic disorder that forces him to involuntarily time travel without any control of where or when he ends up. And as a further inconvenience, he shows up wherever he is completely naked forcing him to steal and therefore get nearby police force on his trail. If and when he gets arrested, however, he eventually just disappears from the backseat of the police car. Amidst all of this, he just as suddenly finds himself popping back into the life of his wife. The thing is that he gravitates toward big events in his life, and Claire was a big event. Except sometimes when Henry appears in Claire's life he is too young to know who she is. Has he not met her yet? And yet it's baffling how that can be since Henry explains frequently to Claire, both as a young girl and an adult, how the two of them met. It was in a meadow where Claire played as a young girl. Henry time traveled to her and appeared before her naked requesting for a blanket to cover himself up. He told her about his time traveling, and she believed him. Even at that moment Henry was in love with Claire, and she even became jealous upon discovering that he was married. Little did she know he was married to her. These scenes in the meadow are meant to be enchanting and sweet, and yet, unfortunately enough, they feel strangely uncomfortable as Henry unintentionally creeps on an innocent little girl. At their wedding Henry disappears right before the ceremony. He appears somewhere else naked, and then a much older version of him returns with graying hair for the vows. Moments later, he disappears again only to return much younger than before to share his first dance with his wife. Henry can appear someplace in time during moments where he is able to watch himself. Other times it's curiously just him in the world as Claire waits for him all the while. If you begin considering the lapses in logic or the downright absurdity of this entire time-traveling "inconvenience" that hinders the romance, well then, give up all hope now. This is a movie that asks you to simply take everything in stride and get the hang of the nonsense as best you can. Once you have done that, you can really then focus on the core of the movie, and that is the surprising chemistry between Rachel McAdams and Eric Bana. They're both just really nice together, and even when things start getting terrible, they can just smile those smiles of theirs, and it all ends up seeming better. The sincerity of their relationship ultimately turns to sappiness, though, and the overall result that's meant to be a sweeping romance ends up being only a mere dabble into weepy melodrama. And yet considering the material, director Robert Schwentke ("Flightplan") and screenwriter Bruce Joel Rubin ("Ghost") do an admirable job of mostly ignoring the time-traveling complications that could have really complicated things to an unbearable extent. Just watch how Henry and Claire love each other, and that's all you need. That's all there is to "The Time Traveler's Wife," really.